The equivalent of putting socks on your home! There are two areas of heat loss from a floor slab. First, and foremost, is the perimeter loss. This is due to the fact that the shortest distance from the slab to the outside is at the perimeter. Approximately 80 per cent of the heat loss occurs through the edge. Notice how the vertically installation in this drawing has little effect as it is installed in the wrong place. The second heat loss area is the downward heat flow from the slab. If the ground has no moving water, this heat flow generally moves in a radial pattern down and out to the edges of the slab and then up to the ground surface. All heated slabs and unheated slabs with a conditioned space above, lose heat in this manner. Warm floor slab edge insulation is essential. No one should be installing a radiantly heated slab, without this important piece of insulation. The important thing to keep in mind is that there must be a thermal break between the slab and any direct path to the outdoors. A slab may be insulated on the entire bottom side, but if it is poured up against a foundation wall that is not insulated, the heat will travel through the foundation wall to the outside just like draft up a chimney. These diagrams indicate the energy loss through three different floor systems, un-insulated, 50mm of horizontal insulation and Steadfast Warm floor 100mm continuously insulation. The house is square and has floor area of 100 square meters. The walls and roof are insulated and the windows are double glazed. The house is exactly the same in all three scenarios except for the floors. Insulating the floor is often ignored as the data states that only 15% of heat is lost through this area. This data was based upon an un-insulated house. Heat will escape via the path of least resistance and if the house is insulated everywhere else, approximately 60% of heat loss will escape though the floor. 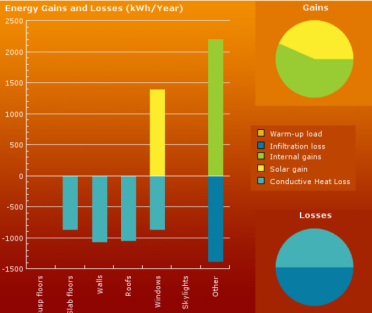 The chart shows that more heat is lost through the floor, than the walls, roof (ceiling), and windows combined. Horizontal insulation does make some impact, but as the chart shows, most of heat is still lost through the perimeter where there is massive thermal bridge. Concrete is a poor insulator and steel is a conductor, the opposite of an insulator. Although the steel is a smaller amount, heat will travel through it 50 times faster than it will concrete. It is one of the main reasons why up to 80% of floor heat loss is through the edge foundation perimeter. The steel in the concrete floor is connected to the foundation. This steel conducts the heat from the floor and rapidly transfers it to the cold foundation outside. 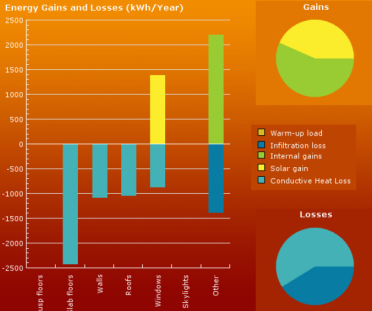 The chart clearly shows the energy saving performance of warm floor. Compared to an un-insulated floor and a floor with 50mm of horizontal insulation, warm floor will save annually approximately 2400KW and 1700kw respectively (based on a floor area of 100 square meters). At 23 cents a KW, warm floor pays for itself in 3-4 years (depending upon design). After that, the savings only increase, especially when you consider energy costs double approximately every 7-8 years. Add those savings to your mortgage repayments and see how many years it takes off. Properly insulating your slab-on-grade floors not only will help you save on energy bills, but will also improve your home’s comfort. Cold concrete slabs can be a source of discomfort in a home. An insulated slab reduces heat loss, making it easier to heat. 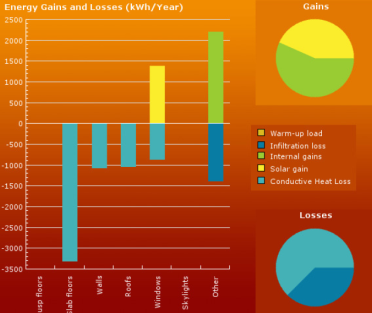 This reduction in heat loss helps moderate indoor temperatures. There is another good reason for insulating under the entire slab. The heated slab will respond much faster to control inputs when it is not dragging the ground along as it changes temperature. Insulation under the slab can reduce temperature swings in the heated space and respond quicker to new changes in thermostat settings. Under floor heating systems basically turn the entire concrete floor slab into one very large heater. The heated pipes are tied to steel reinforcing which is linked to the cold foundation. It is important to separate this link with insulation and place the insulation where it directs the heat into the living environment. Warm floor will heat a house faster and reduce its running cost. The size of the heating system can be reduced and this will save initial start up costs. 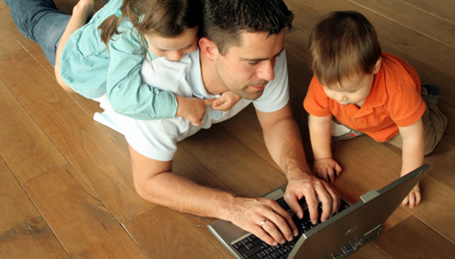 Talk to Steadfast about a reputable heating company, we can point you in the right direction. Yes it does. Putting insulation, and a lot of it, where it’s not normally installed. With good design, the pay back can be between three to four years or even sooner, if underfloor heating is used. Heat rises, how it can be lost though the floor? Not quite, heat does not rise, hot air does. 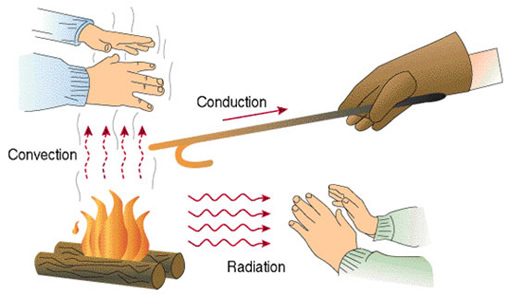 Heat is lost through the floor due to conduction (two objects in contact with one another). If it was a cold day and you wanted to go outside, would you wrap up warm with a jersey, a coat and a woolly hat and yet leave your feet bare, in contact with the ground? NO, your feet wouldn’t be insulated, they have no socks on and it affects your whole body, just like a cold perimeter floor does to the rest of a house. How does it affect thermal mass? Thermal mass will now become effective. Warm floor is the most cost effective way of incorporating thermal mass in your home. The thermal mass was always going to be there, it just needs insulating to make it effective. A further option to add additional thermal mass is to create a solar storage channel. This is very cost effect and is best located within the path of direct sunlight. Can the Insulation in the Warm floor system be increased? Why don’t most houses have it? Initial cost is one reason, a lack of knowledge and desire to be energy efficient is another, but the most likely reason is that it was difficult to do. The patented floor system method is simple, cost effective and very energy efficient.